Long Island's Newsday newspaper has made this Allan Sherman Day. Major story in today's paper with teaser views here and here. 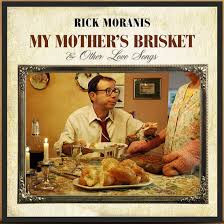 New Sherman-Inspired Rick Moranis Album--Is It "Too Jewish?" They said Allan Sherman was too Jewish. They were wrong. But the new Rick Moranis album just might be. Huge thanks to my brother Neil who, as they say in the Mafia, is a connected guy. "The story of [Sherman's] surprising rise, his heartfelt comic art form, his impact on the image of Jews in media as well as his rapid fall from grace -- leading up to his death only a decade later at age 48 -- is told with intimate details, an affectionate touch of humanity and lots of his parody lyrics in the well-researched book Overweight Sensation: The Life and Comedy of Allan Sherman by Mark Cohen." Elli at broadwaykingdom.com had someone point a camera at me and I talked about Allan Sherman. We commandeered the stage at the Museum of Jewish Heritage before my talk there on May 29, 2013. 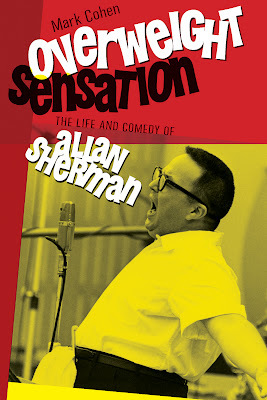 While researching Overweight Sensation I discovered about 20 lost Allan Sherman recordings. These were Sherman's "Goldeneh Moments From Broadway," which was his title for his collection of Jewish parodies of the Broadway musical. This one, "Frank Cooper," is a parody of West Side Story's "Maria." It tells the comic tale of Sherman's relationship with legendary Hollywood agent Frank Cooper. It took me a while to piece it all together, but now it's overwhelming. 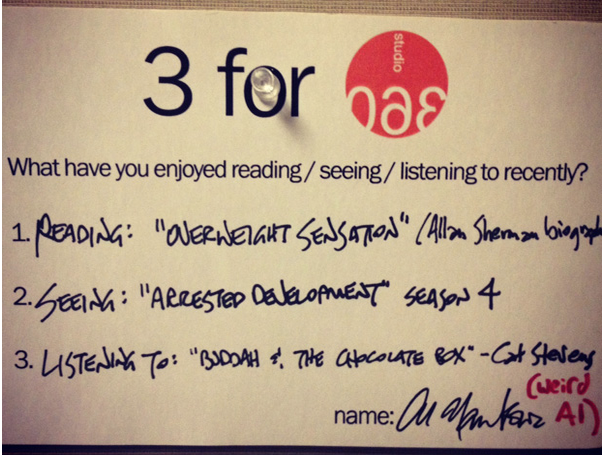 Allan Sherman might be the most influential comedian of his time. 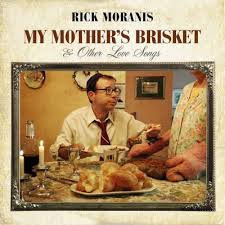 This week comic actor Rick Moranis of Ghostbusters released My Mother's Brisket & Other Love Songs. The Jewish song comedy album was based, of course, on Moranis' early exposure to Allan Sherman. Then I found Jerry Seinfeld on Comedians in Cars talking Sherman with Joel Hodgson. And then there was Larry David singing Sherman's "Shake Hands With Your Uncle Max." Larry David sings "Shake Hands With Your Uncle Max"
Plus, Alexander recorded "Shake Hands With Your Uncle Max." Then I found Paul Reiser of the hit series Mad About You telling a journalist that, “One of my greatest moments with my kids is sitting down and listening to ‘Hello Muddah, Hello Fadduh.’ It’s still funny and it still works." And of course Adam Sandler's famous "Hanukkah Song" has been recognized as "the song put Sandler on a continuum with the likes of Jewish song parodist Allan Sherman." So that's Rick Moranis, Seinfeld, Larry David, Jason Alexander, Paul Reiser, and Adam Sandler. 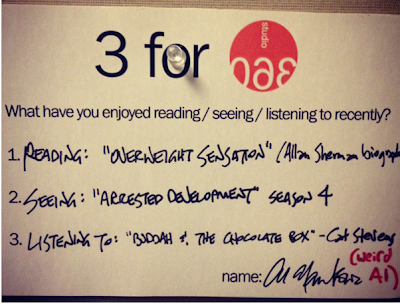 Not a bad list of Allan Sherman comedy students. 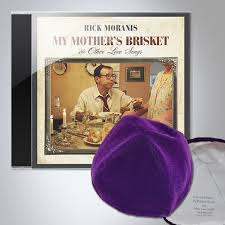 Finally uploaded Sherman's Jewish parody of Cole Porter's "You're The Top"
With an album title like My Mother's Brisket & Other Love Songs, Rick Moranis of Ghostbusters fame hardly needed to say that Allan Sherman was one of his great comedy influences. "When I first began writing jokes and sketches with various Jewish partners one of us would inevitably stop at some point and announce, "Too Jewish!" Too Jewish for the star, the show, the network, or the audience. The songs on this album are all in that category. 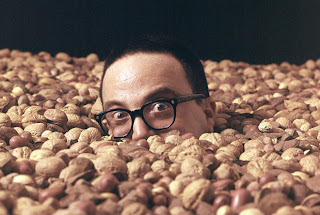 I grew up hearing the Allan Sherman and the You Don't Have To Be Jewish albums in the 60s. Now I m in my 60s." Brisket appears next week and the timing is perfect. This summer is the 50th anniversary of Sherman's Grammy Award-winning "Hello Muddah, Hello Fadduh" summer camp song, and my biography of Sherman is out now and getting press on NPR's "All Things Considered," the Chicago Tribune, and more. Even after a half-century, Sherman's influence lives on. The "Printers Row" section of the Chicago Tribune is available only to subscribers, but you can click here to see a preview of the paper's positive and thorough review of Overweight Sensation, the biography of Chicago-born Allan Sherman. "I shall reward your impertinence by striking you upon the cranium." Search for Allan Segal, as Sherman was then known. And that's him in the top row, first on the right. Hear my interview with Robert Siegel of NPR's "All Things Considered" as we discuss my new Allan Sherman biography.